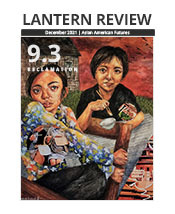 Lantern Review aims to provide a virtual space in which to showcase Asian American poetry and to engage with issues relevant to its production and dissemination. We seek to publish expertly crafted poetry in a variety of forms and aesthetics, including traditional and experimental pieces, hybrid and multimedia projects, and new translations. We welcome submissions from anglophone writers of all ethnic backgrounds whose work has a vested interest in issues relevant to the Asian diaspora in North America, as well as work created collaboratively in a community context. Lanterns are cross-cultural symbols of aesthetic beauty, hope, festivity, and enlightenment. They have historically been a feature of community celebrations, and are also linked with exploration, discovery, and the forging of new paths. By choosing a lantern as our emblem, we hope to reflect our desire that Lantern Review would help to shed light on the multifaceted, ever-evolving creature that is “Asian American poetry,” as well as to be a stage on which the question,“What is contemporary Asian American poetry and where is it headed?” can be played out. Magazine: Our web-based magazine showcases new poetry, visual art, translations, and hybrid or multimedia work, as well as collaborative work that has been produced in a community arts setting. Blog: Our blog features editorial reflections and news—and bosts a robust archive of interviews, reviews of poetry collections, writing prompts, and more. Newsletter: Our quarterly email newsletter, Lumen, provides slightly more intimate meditations on what goes on behind the scenes of Lantern Review, with personal insights drawn from our editors' writing lives.